Sufre sordera desde niño. Lee vorazmente, estudia arte, diseño y tipografía. 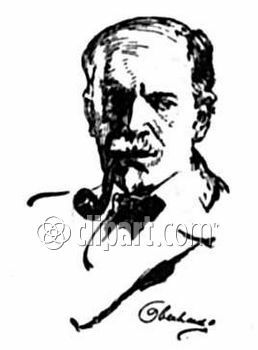 Juanto a Ralph Holden, de Charles Austin Bates, abre Calkins & Holden. Su éxito como agencia moderna proviene de su énfasis en diseño, impresos, empaques y materiales promocionales. Contrata los mejores diseñadores, talladores y artistas. Su personaje Phoebe Snow vestido de blanco, para la compañía de trenes Delaware, Lackawanna & Western Railroad le da énfasis a un modo de transporte sin tizne. Cuando arriba la radio, se retira; su sordera es finalmente un impedimento. The famed copywriter Earnest Calkins once said, "Advertising is the supreme flowering of a sophisticated civilization." Ever awed by the power of advertising, Calkins wielded that power with a facility that brought acclaim from the whole of the advertising world. Calkins founded his company while writing copy in New York for $35 a week. In 1902 he and Ralph Holden decided to try their luck opening up their own small advertising shop. With Calkins' talent, they soon became successful. 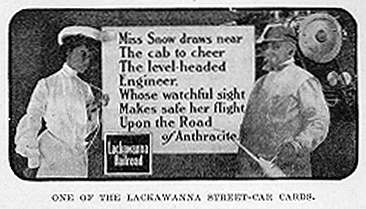 He was the brainchild behind the "Force Food" character, Sunny Jim, and "Miss Phoebe Snow from Buffalo," the young woman dressed in white in the Lackawanna Railroad ads. The agency itself became an innovator for its time. Under the skillful direction of Calkins, it was credited with devising the first complete plan for an advertising campaign. Also, it was the first firm to merchandise an advertising campaign to salesmen and dealers and to have an internal typographical and art department. Calkins' various accomplishments earned him Harvard University's Edward Book medal, which was inscribed, "to the individual who has done the most to raise the standards of advertising." He was also praised as "the one who more than any other single man brought dignity and stature to our business" by the Art Directors of New York. When Calkins died at age 96, Advertising Age headed his two-column obituary, "Giant of Creative Advertising," commemorating a man whose brilliance shaped advertising's formative years. Earnest Elmo Calkins (1868-1964) was born in Galesburg, Illinois. A bout of measles at the age of 6 left him "almost completely deaf" by the time he was 14. He started his career as a typesetter, and then in 1901, started the advertising agency "Calkins and Holden" with Ralph Holden. His main contribution to the field of advertising was to promote the improvement of the quality of art used. He started a high quality art department at Calkins and Holden, and encouraged the hiring of talented artists and illustrators. His hope was to make advertising akin to fine art, and elevate billboards into "the poor man's picture gallery". In 1920, he encouraged Louis Pedlar[who?] to form the Art Directors Club in New York. 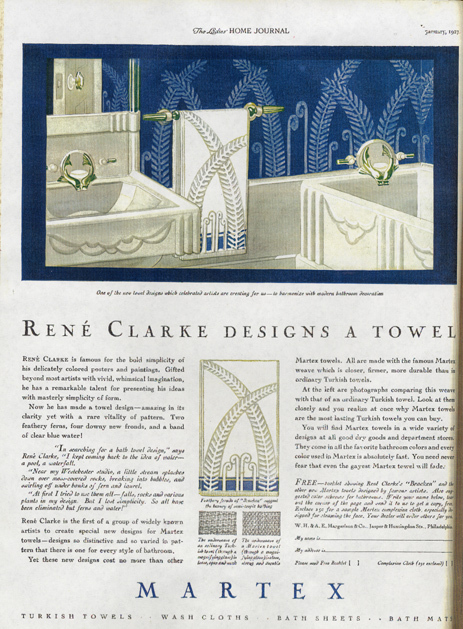 In 1921, "to "dignify the field of business art in the eyes of artists" and communicate the message that "artistic excellence is vitally necessary to successful advertising," Earnest Calkins organized ADC's first annual exhibition". One of his theories featured in the book of the same name was that of "consumer engineering," or the artificial creation of demand for a product using design and advertising. He describes the situation in 1929, that the speed of production had "outstripped consumption". His answer to this problem is not to slow production, for "that would be backward." He instead suggests manufacturing demand for product through planned obsolescence. I.e. why would you want last year's hand bag when this year's hand bag is so much more attractive? He asks "Does there seem to be a sad waste in this process? Not at all. Wearing things out does not produce prosperity. Buying things does". Often the ''movers and shakers'' of yesteryear were too busy ''moving and shaking'' to take good notes. Such was the case with the founders of Knox College and the early settlers of Galesburg. As a result, the unattended task of recording the early history was picked up and attended to by Earnest Elmo Calkins. When he wrote They Broke the Prairie in 1937, he planted the seeds of history for Galesburg, while sowing silent fields. Carl Sandburg wrote of Earnest Calkins: ''Šhe wrote a book, They Broke the Prairie, one of the most interesting histories ever written about a small American townŠ.'' (Always the Young Strangers, 1953). Calkins was born in Geneseo, Ill. on March 25, 1868. His parents were Mary Manville and William Clinton Calkins. William Calkins was an attorney. As a result of childhood measles, Earnest Elmo Calkins lost much of his hearing by age 6, although it was not recognized until he was 10 years old. He ultimately lost all his hearing and mastered lipreading. But, like most successful people, Calkins encountered the right people at the right time. One of these, Calkins recalled, was a high school Latin teacher, Ida Miller McCall. Ida told Earnest ''I want you to succeed, not in spite of your deafness, but on account of it.'' Calkins graduated from high school. Calkins attended and graduated from Knox College in 1891 with a BA degree. Education was a challenge, given his hearing loss. The printed word became all the more important to him. It came to him, unblemished, unimpaired. He initially wanted to be a journalist but found this was difficult without hearing. Calkin's first taste of success in the relatively new field of advertising came while he was working for a local newspaper. The manufacturer of a carpet sweeper offered a $50 prize for the best advertisement for his sweeper as a Christmas gift. 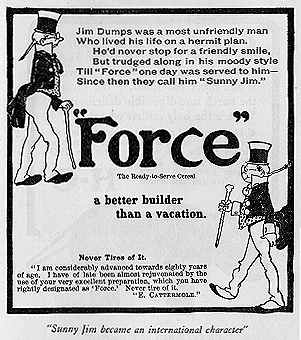 To be qualified for consideration, however, the ad had to first appear in a newspaper. Calkins prepared an ad and it appeared in the paper, touting the Bissell Sweeper for the G. B. Churchill Company. Calkins' effort paid off, being selected out of approximately 1,433 submittals. From this start, Calkins launched a professional career that took him to Peoria and then to New York, developing and expanding his advertising abilities. While in New York, he became friends with Ralph Holden who was, at the time, an unhappy employee of the freight department of the Baltimore Railroad. Holden became a fellow employee with Calkins. Both worked for Charles Austin Bates. Bates was the judge that selected Calkins' sweeper ad as the winner, a number of years earlier. In 1902, Calkins and Holden formed their own advertising business. They expanded the concept of what advertising businesses did for their clients. Their prospectus announced ''Two men with an idea.'' They were well suited for each other. Calkins had the talent, and Holden had a clear speech that allowed Calkins to easily read his lips. Additionally, Holden had the business and sales sense to make the new business grow. They developed their own in-house art departments. Their efforts succeeded. They represented large and well-known clients, including Squibb, H. J. Heinz, and Thomas A. Edison. 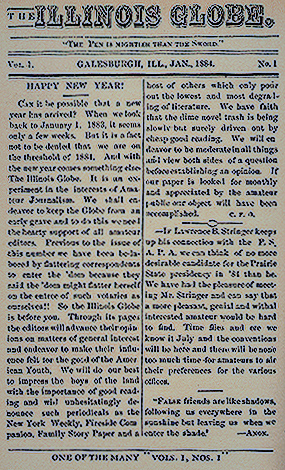 They also did promotions for magazines such as The Saturday Evening Post and McClure's. 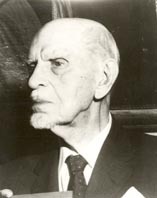 Calkins retired from the advertising business in 1931. 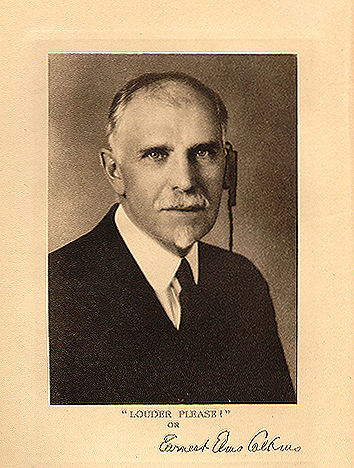 With the development and success of the radio and with Holden's death a few years earlier, Calkins felt that his deafness had become too much of an impediment in the advertising business. On the bright side, the closing of the advertising door was the opening for Calkins into an interest in history and writing books. His They Broke the Prairie, published in 1937, covered the grand and the minute of Galesburg and Knox College. Some of his observations on the change of Galesburg, and of small Midwestern towns, in general, seem more eloquent today than they were over 60 years ago. Calkins reflected on how the Midwestern towns in general, and Galesburg, specifically, had changed over a 100 year span. Not content with the success of his book in preserving the successes and failures of early Knox College and Galesburg, Calkins wanted to put in place an on-going historical perspective. On June 11, 1944, Calkins could be found speaking before a small collection of elderly Knox College graduates. The site was at the home of Knox College trustee, Jane Grieg Post (class of 1894), in Oneida. These 25 or so elder folks were graduates of Knox from the class of 1894, or earlier, thus being out ''in the real world,'' as they say, for at least 50 years. From this small start, the Fifty Year Club was created for Knox College. The purpose of the Club was to preserve and record Knox College's (and Lombard College's) history. From its humble start, Knox College now reports that the club has over 2,000 members. Ignoring his deafness, Earnest Calkins stepped forward to record and to preserve both the early history of Knox College and Galesburg. In that process, he has carved out his own place in that history.